Some debuts cause a stir. The Memory Painter makes quite a splash. As bedtime reading goes, the book is hard to put down. 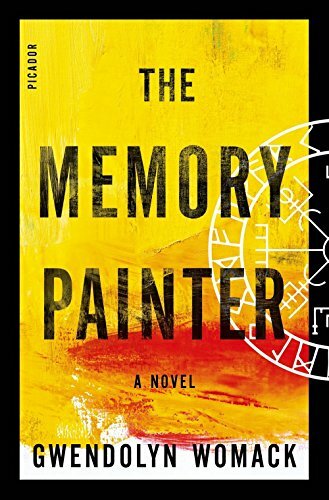 The most succinct description of Gwendolyn Womack’s novel is that a group of neuroscientists unlock the secret of memory and past lives. It nimbly amalgamates genres of history, fantasy, sci–fi, horror, and thriller. Its opening pages grab the reader with images of half-remembered characters who struggle to hold on to what they imagine is their identity. Protagonists Bryan and Linz descend from the 1980 inventors of a dangerous yet lucrative drug that awakens those who take it to their past lives. It’s a drug worth killing for, and sweeping deaths ensue in these pages. The author’s background in script writing and painting, together with her travels in Russia, Japan, and other far corners inform this novel that deftly interweaves ancient history, scientific speculation, boy-girl romance, and the highest and most base impulses of humankind. Bryan never studied drawing, yet he paints in a manner akin to automatic writing. “His hands moved with a strange certainty in the dark.” He executes his exacting canvasses in the dead of night, yet has no recollection of having done so in the morning. “Each image captured a different time in history, a different place in the world.” Yet all of them uncannily illustrate the most intimate moment of someone’s life or death. Hoping that someone might recognize them for what they are, Bryan displays his canvasses at a gallery run by old friends. At the novel’s opening he has been searching blindly for years. The drug Renovo, synthesized by Bryan’s forbearers, has the unexpected side effect of making those who ingest it recall memories from their earliest childhood, even from infancy. The question that propels the book then becomes: If the drug is effective in damaged minds, then what is its effect on healthy ones? The opening of this Pandora’s box propels the sweeping adventure that ensues. The book’s action ranges between the 1980 science lab to the present and the millennia hence. Cleverly, the narrative circles back to where it began. The plot features multiple payoffs from events set up earlier, something that sophisticated readers always welcome. The relationships in the time travel story are never so implausible as to spoil the illusion. Happily, Ms. Womack’s “what if” musings ends on a firm note of optimism.